In simple words, Plagiarism means copying, stealing someone’s work like poem, article, expression, or any written document and then publish them under your name and authority. It is an unethical habit mainly happening in the Internet publications and only newbies do such stuff of copy some pro’s work and publishing them on their website with minor changes. Fortunately, there are many tools nowadays that can identify whether the posted article or document is plagiarized or not. Today, we have a very remarkable and excellent plagiarism checking tool, and believe it or not but it is the one of best tool available on the web right now. Plagramme is the name of this excellent tool, and it does much more than just identify the plagiarism in the documents. 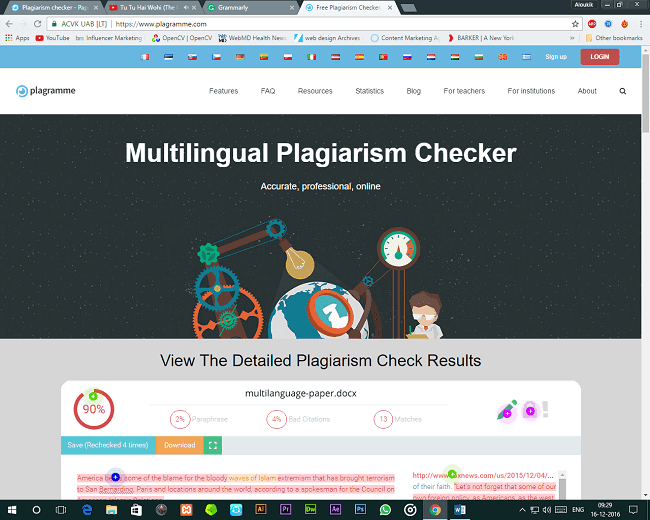 Plagramme is a free multilingual plagiarism checker tool that helps you to identify any possible plagiarism in the documents. Moreover, it also detects every wrong citation, paraphrases, etc. Plagramme is useful as it’s smart algorithm crawls and checks for plagiarized content from millions of online resources. So, let’s dig deeper and start the review of the Plagramme Plagiarism Checker tool. The first thing that stroked my mind was that despite offering so many remarkable features, why this tool is free to use? Well, the company is aimed to help students, writers, scholars, and institutions with such great solutions for educational purposes. 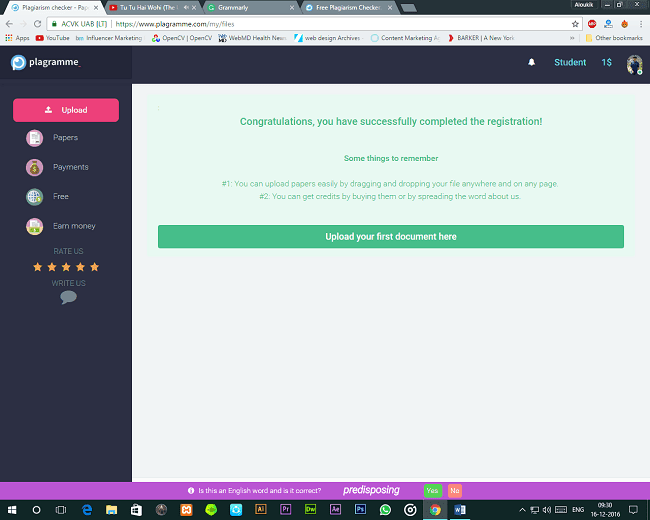 You can start right from signing up on the official website of Plagramme. You can either log in with your Facebook, Twitter, or LinkedIn. Moreover, the site offers free credits to all the student accounts. I too got a free $1 credit that could be used on any of Plagramme’s premium services. See also: - Spreeder CX Review: Does It Really Help You Read Fast? Plagramme has so far, the best user interface I’ve ever seen for any free tool or service. The font style, text formatting, and syntax highlighting are integrated beautifully into the platform of this plagiarism checker. You can either copy-paste the content or upload the document directly into the tool. The scores are displayed after a full analysis of the article and surprising; the tool only takes few seconds to detect any possible plagiarism in the document. Erudite Scoring System: - For any plagiarism tool, the first thing that any user notices is the analyzing capabilities of the tool. 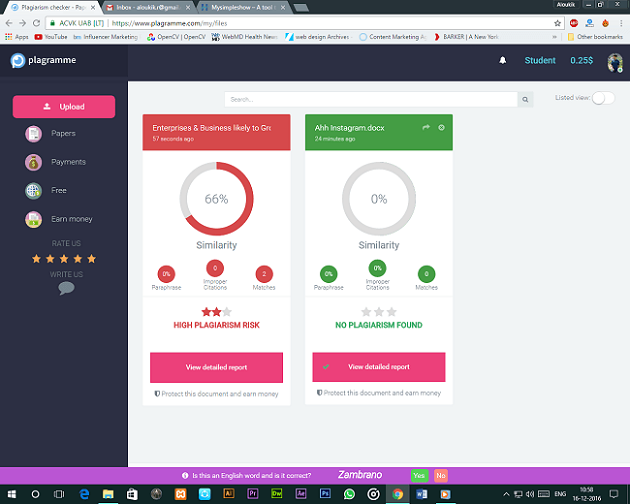 Since Plagramme uses a quite advanced scoring system, you can rely on it for every checking purposes. It can identify elements like paraphrasing, risk score, bad citations, similarity score and possible match resources in the content. Highlights & Matches: - The interface of the tool automatically highlights the plagiarized sentences or paragraphs which can be easily altered to make it original. The tool is multilingual and is compatible with some regional languages as well. That’s why the tool has been recognized globally in the latest. Viewable sources: - Not only does this tool identifies the plagiarized content but also displays the online sources, from where the document has been copied. You can get the external links to different websites, documents, or the blog posts from where the content has been copied. Paraphrase detection: - Since some smart amateurs arrange the paragraphs of the document so the document cannot be identified as plagiarized, Plagramme has added the paraphrase detection feature in its checking tool. It can quickly determine whether the paras have been rearranged or not. Cloud Save: - Plagramme also offers a cloud save feature where you can maintain all your documents and papers in your account online. The platform manages the format and presentation of the paper and keeps them intact. Ease of Uploading: - With Plagramme, you can upload the documents from anywhere and anytime on the website. The maximum upload limit of the upload is 50 MB, and major word document formats are supported by the tool. Lucky for us, Plagramme didn’t find any plagiarized content in my upcoming article. No improper citations, no paraphrases, no error whatsoever. So, you can trust on the tool without any doubt. All in All, Plagramme is an exclusively available tool, free to use and to test the originality of any text, document, publication, etc. Plagramme is free to use and provides reliable results that are often better than other premium tools like Grammarly, etc. The interface is super-simple and quite attractive to look at. The scoring system measuring the quality of the of tested document by various points and it also displays the relevant suggestions to improve the article. It is a life safer for all the amateurs, publishing houses, and students. 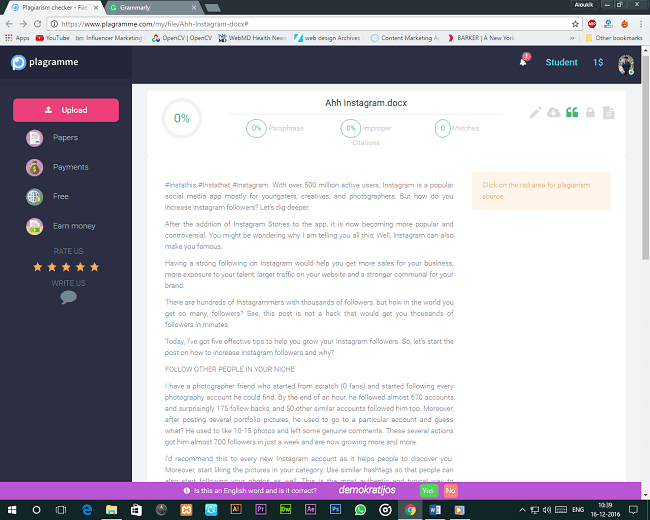 The entire Plagramme platform is too good for a free tool and trusts me on this; you’ll never use any other tool than Plagramme for checking plagiarism furthermore.